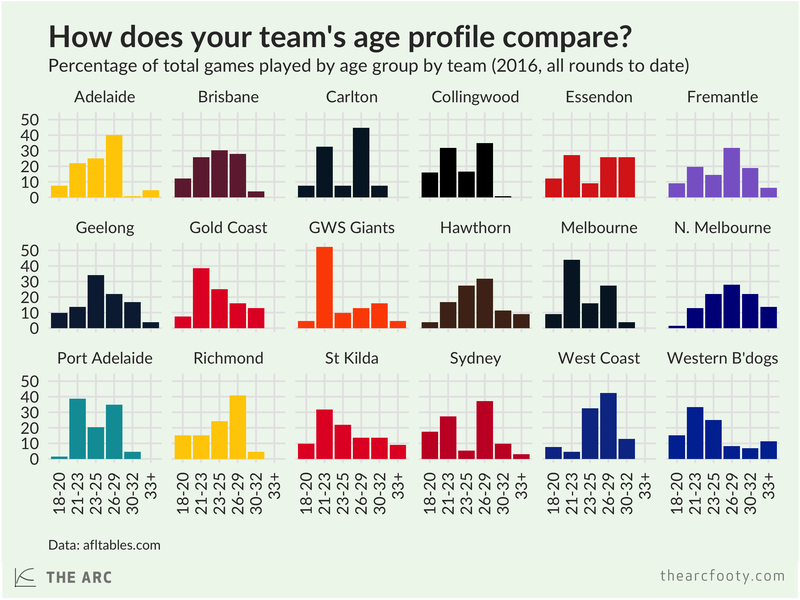 We’ve previously taken a look at the age distribution of each club, showing that the Bulldogs are young, the Kangaroos skew old, and Adelaide are about the league average. The previous post was based on the 22 players that each club fielded in Round 4 this year. But, of course, teams’ age profiles might look a bit different if we take the whole season thus far into account, rather than just an individual round. The chart below groups all players into one of six age groups. It shows what proportion of a team’s total games so far have been played by players in each group. Each team’s players have played 132 games so far – 22 players per game for six games (maths!). So if your team has two youngsters who have each played 5 games, they count for 7.5% of the total. Over half of GWS’ games so far have been played by players in the 21-23 age group. They’re a terrifyingly young squad, which is no surprise, but it’s still striking when you see it here. The Bulldogs also skew young, but they have a much larger share of players in the more developed 23-25 age group. 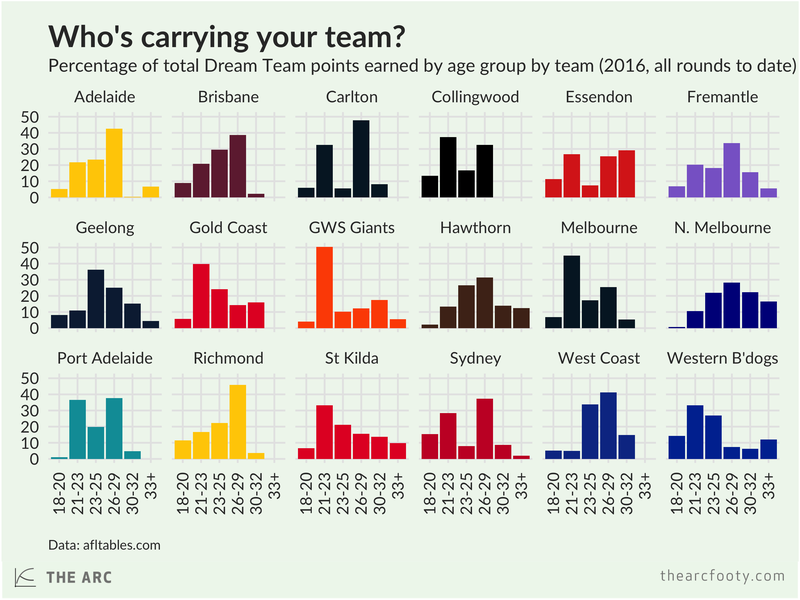 Carlton have relied quite a bit on players in the 26-29 year old age group – surprising for a team at their stage of the rebuild cycle, although they also have a fair number in the 21-23 up-and-comer bracket. Richmond’s playing group has also been dominated by guys in the 26-29 age group, which might be cause for pessimism about the prospect of the Tigers improving by a lot in the next year or two. Port, by contrast, have given a lot of games to guys in their early 20s, players who likely still have a fair bit of upside. Based on this, I’d be less pessimistic about their prospects over the next 3 years or so than the Tigers’. West Coast’s playing group is dominated by players in their mid-to-late 20s, which should be good for their prospects in the next few years, but perhaps cause for a bit of worry over the longer term if the young players on the list don’t get a few games under their belts. Interesting! Another interesting question is: which age groups at each club have generated more Dream Team / Fantasy points so far in the year? As I’m sure you know, each player is awarded four points for a tackle, three points for a kick, and so on. They’re not perfect as a measure of players’ contribution, but they’re just about the best thing we have, at least those of us not blessed with access to Champion Data’s proprietary secret sauce. The chart below shows the percentage of each team’s total Dream Team points that have been generated by players in each age group at each club. For example, the Bulldogs have racked up a total of 10 597 DT points so far. Out of this total, 1 507 have been generated by players aged 18-20, representing 14.2% of the total. Most clubs’ profiles look pretty similar in both charts. But the reliance of Richmond and Carlton on players in their late 20s is even more stark in the second chart. Note: This post is based on the age and contribution of players who have played so far in 2016. It doesn’t take into account clubs’ full lists.